Western Montana by bike is the perfect way to cover our epic terrain while breathing in the fresh mountain air. Clip in for a multiday cycling adventure, pedal up the awe-inspiring Going-to-the-Sun Road, shred a single-track mountain biking trail or find a family-friendly path like the Route of the Hiawatha or the Bitterroot Trail. Biking options are diverse and many, so there’s something for every skill level. Miles of trail systems crisscross the region, and helpful trail maps can be found at local visitor centers, ranger stations or forest service offices. Didn't bring your bike? Check out available bike rentals. The local bike shops and adventure services listed below can also help get you outfitted for a bike ride, and/or point you in the right direction for an adventure on two wheels. Be sure to play it safe and stop at a visitor center, ranger station or forest service office and pick up trail maps. Here’s a List of Popular Glacier Country Biking Destinations. This 7-mile trail (719) begins at Forest Service Road 5565 and ends at Trail 720. The trail is within Lolo National Forest near Huson, MT. From I-90, take the Petty Creek Exit. Go south across the river, turning east onto Southside Road 453. Follow for 14 miles to Albert Creek Road 5568. Follow 4.5 miles to trailhead. This 50-mile-long paved trail connects Missoula to Hamilton. Ride along the Bitterroot Mountains and the charming small towns of the scenic Bitterroot Valley. The southern end of the trail is located 2.5 miles south of Hamilton near Angler’s Roost Campground. The northern end of the trail is located at the intersection of the Milwaukee Road Trail in the Old Sawmill District of Missoula. A diversified use area, Blue Mountain Recreation Area has ATV and motorcycle trails, horse and foot-only trails, mountain biking trails, a handicapped access overlook and an interpretive trail. Sitting above the recreation area is an active fire lookout, as well as the Graves Range Trail for 4x4 driving. The Maclay Flat Interpretive Trail also provides 1.5 miles of accessible trail along the Bitterroot River. The recreation area is located two miles southwest of Missoula. Take Highway 93 south to Blue Mountain Road and follow for one mile. The next left is Lookout Road, while the next right is the Maclay Flat Area. This trail goes from Clearwater Crossing on the West Fork of Fish Creek up to the Idaho/Montana state line. It can also be made into a loop trail by following the Divide Trail north before following one of the many trails back to Clearwater Crossing. This trail is 11 miles long. From Clearwater Crossing, you can also take the West Fork Fish Creek Trail (101). From Missoula, take I-90 west to the Fish Creek Exit. When the road forks, take the west fork to Clearwater Crossing. This moderately difficult 3.5-mile trail, located in the Bitterroot National Forest, begins at Forest Service Road 596 and ends at Camas Lake. From Missoula, take Highway 93 south to Hamilton. Continue south for 9 miles and turn right on Lost Horse Road. Continue for 2 miles before turning right at the Forest Service Camas Creek sign. Follow the road for 6 miles to the trailhead. This scenic, mostly ridgeline trail provides beautiful views of several drainages. The trail begins at Forest Service Road 378 and ends at Forest Service Road 7709, for a total of 13 miles. It has several access points. From Plains, travel south of Road 508 to its junction with Combest Road 7698. Turn right and drive 3 miles to the trailhead. This trail climbs up to an alpine lake, just under the Continental Divide. From Missoula, take I-90 west to the Fish Creek Exit. Take Fish Creek Road 343 south for 9 miles, before turning west onto West Fish Creek Road 7750. Continue for 7 miles to Clearwater Crossing. This trail is located mostly on or near ridge tops, offering beautiful views of the Cabinet Mountain Wilderness. This easy 11.5-mile trail starts at Teepee Lake and ends just below the top of Brush Mountain. From Libby, travel 20.5 miles south to US Highway 2. Turn left on Teepee Creek Road 6740 and follow 7.3 miles to Teepee Lake. The trail begins near the east side of the lake. Passing through an old mining town on the eastern end, this trail (268) follows the creek. It begins at Forest Service Road 386 and ends at the state line, for a length of 4.4 miles. From I-90 west, take the Saltese Exit (10). Follow Silver Creek Road 5.1 miles to State Line Road 391. Continue 1 mile southeast to the trailhead. The Going-to-the-Sun Road is an ideal ride through one of Montana's icons. During the busy season of summer, there are time restrictions as to when cyclists can be on the road, making spring and fall both ideal times to cruise the Going-to-the-Sun Road. Our suggestion: pedal the Going-to-the-Sun Road from West Glacier over Logan Pass to St. Mary before ending your ride in East Glacier. Once there, hop aboard Amtrak's Empire Builder (bike and all) for a relaxing ride back to West Glacier. From Columbia Falls, travel east on Highway 2 to West Glacier. Turn left onto the Going-to-the-Sun Road. This easy trail (171) leads to the largest lake in the district. Following the South Fork of Trout Creek, it provides beautiful views of the divide before ending at Heart Lake. From here, you can also access the Pearl Lake Trail. From Superior, travel east on the frontage road toward Trout Creek campground. Travel 15 miles up Trout Creek to the Heart Lake Trailhead. This trail network ranges from easy double-track to intermediate single-track. A few trail options can be shuttled from either Emmons Saddle or the Foys to Blacktail trail (FTBT). The Herron Overlook Loop to Chase and Notch overlooks offer excellent views of the valley and Foys Lake. Both single-track descents are fast and technical, though the climbs are moderate. From Kalispell, take Foys Lake Road to the traffic circle and take the second exit onto Foys Lake Road/S. Meridian Road. Turn right to stay onto Foys Lake Road and the destination will be on your right. Beginning at Miller Creek, this trail (9999) features 1.5 miles of dirt road, followed by 2 miles on a grass-covered logging road. It continues down the ridge, joining Plant Creek Road. During summer, watch for logging trucks and other traffic. Take Highway 93 south to Miller Creek Road and follow to Holloman or Plant Creek roads. Either will lead you to the trailhead. From the West Fork of Tyler Saddle, this trail (21) is a single track to the top of Sliderock Mountain, where it connects with several trails in the Deerlodge Forest. The trailhead begins at Forest Service Road 1707. From Missoula, take I-90 east to the Beavertail Hill Exit. Take a left on Road 354 and follow to West Fork Tyler Saddle. This trail system begins and ends at Kreis Pond Picnic Area and Campground, with four trails for various levels of riders covering 25 miles on gravel roads and dirt trails. From I-90 West, take Exit 82. 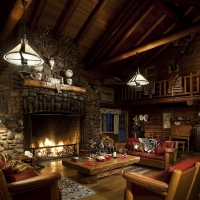 Travel north to the Ninemile Ranger Station. This closed-down ski resort offers a diverse system of mountain biking trails and even a winter bike race—fat bikes encouraged. From Missoula, take 1-90 East and MT-200 E to Marshall Canyon Road, and head up the mountain. Located a short drive from Missoula, Snowbowl has five trail routes for more than 30 miles of riding. For beautiful views of the Missoula Valley, take the 6.7-mile long Spitfire Trail. Or for more technical riding, take the 5.5-mile Beargrass Highway Trail. From Missoula, take Reserve Street north, where it turns into Grant Creek Road. Follow Grant Creek Road for 3 miles before turning left onto Snowbowl Road. Continue 6 miles to Snowbowl. One of the most popular trails in the Seeley Lake Ranger District, this 5-mile round-trip route leads to Morrell Lake and Morrell Falls at the base of the Swan Mountain Range. From the town of Seeley Lake, travel .5 miles north on Highway 83. Turn right on Morrell Creek Road which becomes Forest Service Road #477/Cottonwood Lakes Road and travel 1.1 miles. Turn left on West Morrell Road #4353 and travel about 6 miles. Turn right on Pyramid Pass Road #4381 and travel .25 miles. Then turn left on Morrell Falls Road #4364. Continue for 1 mile to the Morrell Falls Trailhead and parking area. This trail (51) runs along or close to the ridge top, taking riders through lodgepole pine stands, beargrass and huckleberry patches. Along its 4-mile route, it provides pretty views of the Clark Fork Valley and side drainages. This trail can be accessed by Ninemile Divide Road 97 or from First Creek road 536 east of Superior. Located in a wooded canyon near Missoula and sitting at 4,100 feet, Pattee Canyon is a popular location for day hikes and mountain biking. It also has picnic sites and group sites available. Ride the Sam Braxton National Recreation Trail, as it loops around the southeast portion of the Pattee Canyon Recreation Area. The trail begins at the trailhead and ends at the loop for a distance of 3.5 miles. From downtown Missoula, follow Higgins Avenue south. Turn left onto Pattee Canyon Road and follow for 3 miles. This customizable single-track maze of trails covers about 20-30 miles with has some logging roads, moderate climbs, rolling hills and a nice mix of technical and beginner terrain. The system consists of numerous loops, a ride along Cliff Lake and fun downhills. It's easy to get lost here, but it's also easy to find your way out. From Kalispell, travel north on Highway 93 towards Whitefish to West Reserve Drive. Turn left and drive 7 miles to Farm to Market Road (the first stop sign) and then turn right. You'll pass Farm to Market Pork and the Kuhn Wildlife Reserve sign to where the Pig Farm Trails (no official sign just a gated road on the left side) are located on the left. Park on the left side of the road and please do not block the gate. Note: There are many gated roads on the east side of the road but only two on the west side. Trails can be accessed from both of those gates, but the first gate is where the trails officially begin. The riding is on State Land managed by the DNRC and requires a recreation use permit that can be purchased for $10 (annually) at the fly shops in Whitefish. With its major trailhead only 4 miles north of Missoula, this 61,000-acre area forms Montana's premier urban wilderness, blending wilderness and civilization. For biking, try the Rattlesnake Main Trail (515), Ravine Creek Trail (34), Sawmill Trail (24) or Woods Gulch Trail (513). From I-90 in Missoula, take the Van Buren Street Exit and head north. Van Buren Street turns into Rattlesnake Drive. Continue to follow for 3 miles until you reach the entrance. This trail (98) follows the ridgeline and can be accessed from various trails, including Burnt Fork Trail 418, Edith Peak Road 476, Squaw Peak Trail 707, Kennedy Creek Trail 746 and McCormick Peak Trail 708. The trail travels nearly 26 miles, beginning at Siegal Pass near Forest Service Road 54988 and ending at Squaw Peak Road 476. From Missoula, travel west on I-90 to Exit 82. Turn right, travel 2 miles and turn north just before Ninemile House Restaurant. Continue 2 miles to Ninemile Road, bearing west. Take Forest Service Road 393 13 miles and turn north on Foothill Road. Continue 11 miles to Ninemile-Sigel Road, turning onto 5572. The River Trail (223) provides a variety of views and topography, with parts of the trail following the Clark Fork River. The trail's total length is 9 miles and is rated as intermediate to difficult. The north trailhead can be accessed from Highway 135 between St. Regis and Paradise on the west side by 14 Mile Bridge. To access the south trailhead, follows Old Mullan Road from St. Regis for nearly 1 mile. Turn left on Road 439 and continue for 2 miles to its junction with Road 9113. Continue 1 mile. The riverfront trail follows the Clark Fork River in downtown Missoula before connecting to the Kim Williams Nature Trail, providing users with 7 miles of uninterrupted trail access. You can cross the river on one of three bridges along the trail; Orange Street, Higgins Avenue and the Madison Street bridge, as well as three footbridges. Van Buren, one under the Madison Street Bridge and the third just off California Street. The trail is accessible from many points in downtown and along the river. This portion of the Olympian Hiawatha route is noted as one of the most breathtaking scenic stretches of railroad in the country. Operated by Lookout Pass Ski Area, the 15-mile route takes riders through 10 tunnels and across 7 high trestles. From I-90, take the Taft Exit (5), running south. Turn left at the stop sign, cross a small bridge and follow the signs for 2.5 miles on Rainy Creek Road 506. This trail (228) goes to the top of the east side of Rock Creek, following the ridge north to Brewster Creek Road. The total length is 11 miles and it features views of Rock Creek on the west and Flint Creek on the east. From I-90, take Rock Creek Road past Hogback Creek. Look for the Sandstone/Wyman Trailhead at the top of the drainage. This short trail (304) follows switchbacks to an old lookout and features views of Lolo Creek and the Graves Range. From Missoula, travel south to Lolo. Take Highway 12 south, turning left on Elk Meadows Road and follow until you just cross the Idaho border. The trail sign is on the north side of the road. This freeride mountain and downhill trail system outside of Whitefish, Montana offers everything from flow trails to technical trails with expert-only jumps, drops and features. From Whitefish, head west on Highway 93, After Spencer Lake (on the left) take the next left onto Twin Bridges Road. The trailhead is on your left. This trail (267) provides splendid views of alpine country and flora, as the trail begins at County Road and ends at Lower St. Regis Lake. From I-90, take the Lookout Pass Exit. Travel south on Road 7896 on the south side of the interstate. Proceed 1 mile to where the road begins to loop, taking the first road to the right. This trail (58) goes 4.5 miles from the Ninemile Valley to Stark Mountain Lookout. From Missoula, take I-90 west. Take the Ninemile Exit north. At the next junction, take Remount Road and follow to a four-way intersection. At the intersection, go left up Ninemile Creek. Follow Forest Service Road 5511 and take a left at the end of the pavement. Continue to the trailhead. This trail (46) follows the Idaho/Montana border along the Bitterroot Divide and showcases beautiful views of both states. The trail begins at Forest Service Road 595 and ends at Cache Saddle, for a length of 17 miles. From Lolo, take Highway 12 south to Fish Creek Road. Follow north 2 miles to Road 9942. Continue to the trailhead. A ridge trail, Storm Peak (255) provides good views of the Ward/Eagle Peak Area, as well as alpine lakes. It begins at Haugan and ends at State Line Road 391, for a length of nearly 10 miles. From I-90, take the Haugan Exit. Turn south under the interstate, then right before crossing the railroad tracks. Continue for nearly 1 mile (this part of the road in on private property - please be respectful) to the trailhead. This trail (99) travels up to the State Line Divide Trail on the Idaho/Montana border. Following a creek and featuring old grown forests, this 10-mile trail crosses Straight Creek several times. Travel west from Missoula on I-90 to Fish Creek Road, Exit 66. Follow Fish Creek Road 343 south nine mile, turn west onto 7750 and continue for about 7 miles to Clearwater Crossing Campground. An anchor project of the Whitefish Legacy Partners, a non-profit conservation organization, this trail provides more than 22 miles of new trails for hikers and bikers (as well as skiers and equestrians) and is well-marked for moderate to intermediate trail experiences. The trail will continue to expand over the next five years until it has 55 miles of recreational use. The trail provides a beautiful ride through the woods, with glimpses of nearby lakes and the Whitefish Mountain Range. The trailhead at Lion Mountain Loop is just two miles from downtown Whitefish. This trail (318) is one of the Granite Pass area trails to the Bitterroot Divide. Beginning at White Mountain Lookout and ending at Trail 316, this 3-mile trail takes riders through high and dry country. From Lolo, take Highway 12 to the Fish Creek Road (just past Lolo Hot Springs). From here, follow directions on the Lolo West map. 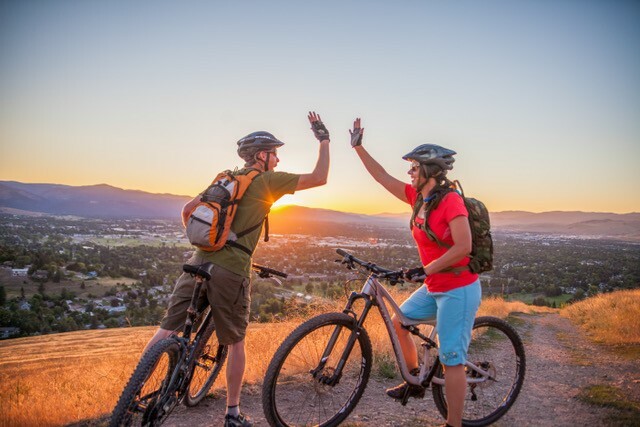 With nearly 30 miles of lift-accessed and cross country mountain bike trails, Whitefish Mountain Resort has distinguished itself as a worthy mountain biking destination. 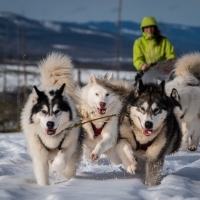 Plus, the resort's extensive network of trails caters to all ability levels. For one of the most scenic rides in Montana, try the Summit Trail. To fine-tune your technical riding, take Question Mark. Or for an exhilarating freeride, try Runaway Train. The resort also offers Mountain Bike Academy for kids (ages 8 - 17) during the summer months, with coaches teaching the technical aspects of trail riding on various terrains. The Big Mountain is located 36 miles west of Glacier National Park, 23 miles from Kalispell and 8 miles north of Whitefish, Montana off North/South Highway U.S. 93 and East/West U.S. Highway 2.